What is the fascination with Unicorns? Many think of these as only my mythical creatures…yet they are found through history and even in the scriptures. 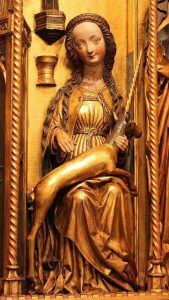 There is even a sculpture of The Virgin Mary holding a Unicorn. Here is another beautiful one. In short, Unicorns have a magic about them that calls to the ancient memories within the marrow of our bones. 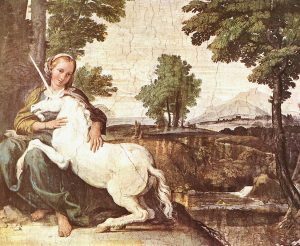 In this Unique Unicorn Energy Transfer… Majestic Queen Natalie will transfer into your Pineal Gland…a seed of Unicorn Magic! Queen Natalie assures me this “energy seed transfer” will cause automatic Pineal Acceleration leading to. This is an intense (no Talking) session only 15 minutes needed. Expect to stay in trance for awhile afterwards so don’t go signing any legal papers! Only 99 for this week only! Appointments available this Saturday and Sunday. Yes, I want my Pineal Seeded by Queen Natalie of the Unicorn Kingdom!